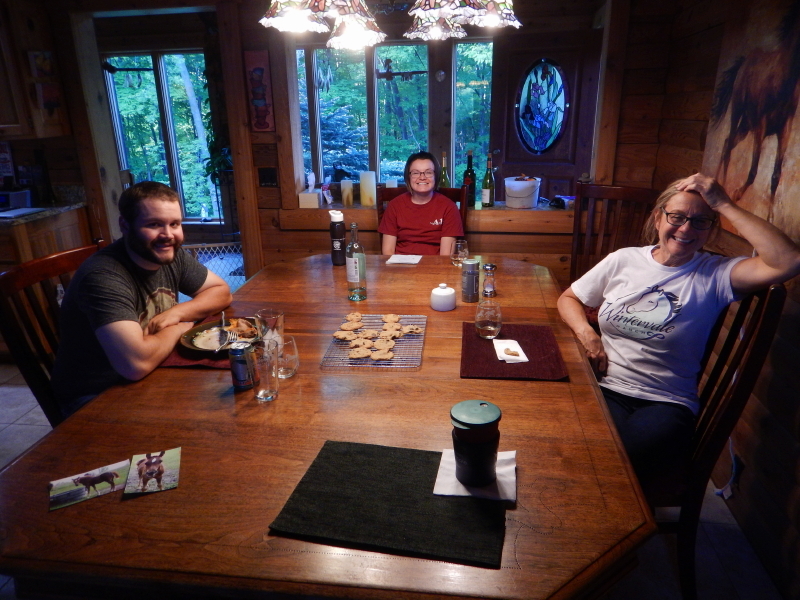 Since the day our friends George and Anneliese moved out to a new home they built in Princeton, MN, our basement “apartment” has been mostly unoccupied. Meanwhile, we have been searching for new sitters to care for our animals and house (needing to replace the services of both McKenna and Shelby, who have each moved away to their next life opportunities) to provide cover for times we escape to the lake place or embark on other exotic travels. Cyndie advertised our search in two primary locations: our veterinary office in Stillwater, and the University of WI, River Falls Ag programs. I did occasional scans of Craig’s List for pet sitters, and thought I struck gold when a perfect sounding post showed up just an hour prior to one of my visits. She didn’t want to travel very far, though, and told us we were out of her Hudson, WI range of service. Then Jackie called. She was in school at River Falls and was hoping to find a room for the summer. Jackie has the horse skills we required and boards her own horse just six miles to the east, in El Paso, WI. In a cosmic twist we never saw coming, when she stopped by to meet us the very first time, Cyndie recognized her date who got out of the car with her. Marcus is the new farrier who has been caring for our horses in the time since George moved. When Jackie mentioned to Marcus that she was going to visit Beldenville to meet Cyndie, he responded that he knew a Cyndie in Beldenville. They quickly realized she was the same person, and Marcus came along for the introduction. Cyndie and Jackie worked out terms and a rough schedule, and now we have a new housemate added to our cast of characters. It has been rewarding to watch Delilah and Jackie’s relationship develop as they spend more time together. In a very short number of days, Jackie has become the latest new member of our ever-expanding family. It’s a bonus that Marcus knows her, too. We feel lucky to have met them both, and to have their help caring for our horses. And, in Jackie’s case, our home and other animals, too! Regardless my wonderfully slow-paced daily routine on the ranch, I cannot keep up with the days flying by that become months sailing away. February just started and now it is over. Humans may not have invented a time machine yet, but who needs it? We are living in one. 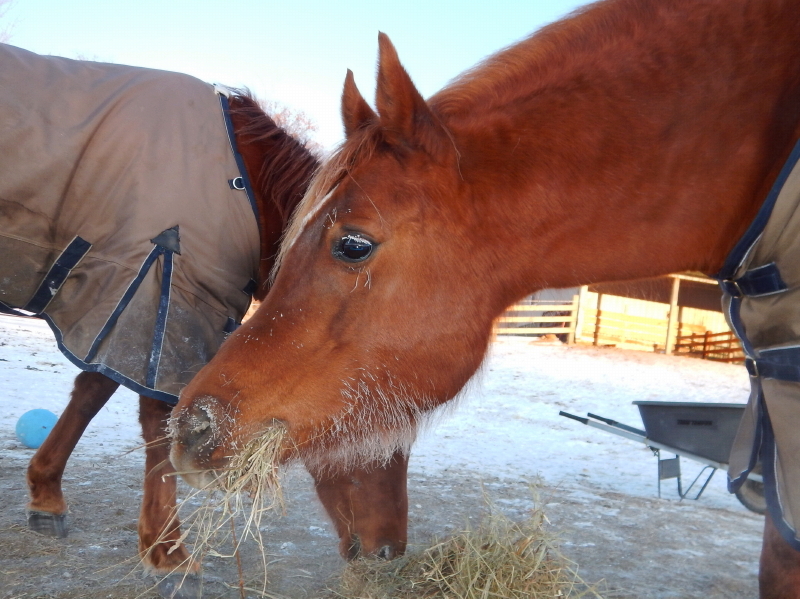 We have been experiencing a string of below zero (F) overnight lows the last few days, but since it wasn’t windy, we left the horses outside to deal with it. Cayenne was able to show off her awesome eyelashes with an icy white highlight in the morning during breakfast. I have been working to prepare for the possibility that someone other than me would be doing the animal chores around here, on the chance that Cyndie would successfully find enough animal sitters to allow me to join her on a visit to our friends in Guatemala. The person that did the job for us over New Year’s weekend was no longer available. Thursday night, with our children’s precious acceptance to figure out a way to fill the few holes in coverage that remained, we made a commitment and purchased airplane tickets. Look out, Dunia and family, here we come! So, I’m hoping to make it as easy as possible for our animal sitters to maintain some semblance of cleanliness in the paddocks. It is not easy to pick up manure that first melts, and then re-freezes into the frozen snow and ice packed on the ground everyday. After the struggle to get it up, hauling it to the compost pile is another battle. I have started to create piles within the paddock where it can be temporarily stored. I brought Delilah with me yesterday to work on the project. She is still confined to a leash when I am unable to give her my constant attention, so I tethered her to a hook on the outside of the paddock fence. There she is able to squeeze under the lowest board and feel like she is not entirely excluded from the action. Unfortunately, she can’t restrain herself from periodic antagonistic barking and snarling fits at the horses when they are close. For their part, the horses seem entirely nonplussed by the big show she puts on, but are complicit in their repeated decision to wander over close to her if she has been calm and quiet for too long. 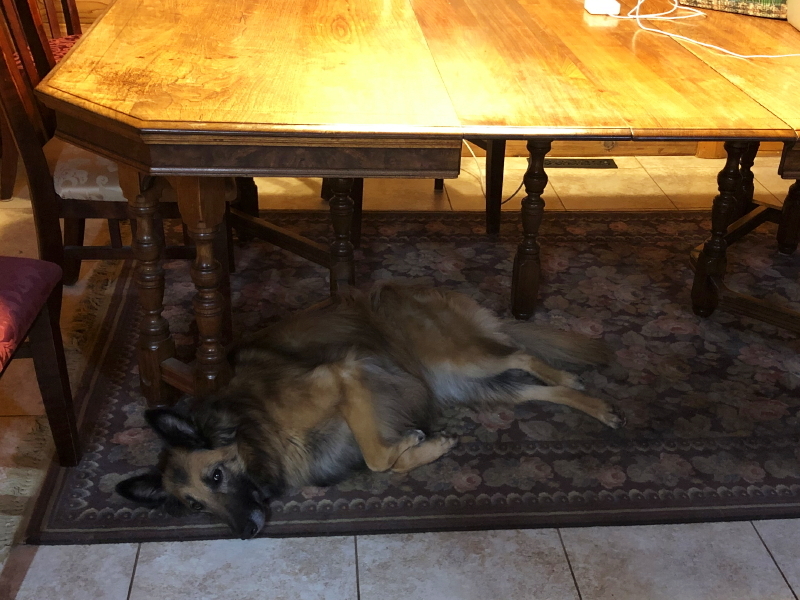 I really delight in seeing them serenely coexisting, which happens for brief glimpses, so in contrast, her sudden outbursts are a jarring disruption to the tranquility. While I was raking away, I glanced up to see what looked like a zen exercise Legacy was employing to convince Delilah to mellow out. Legacy looked like he was sleeping, except that he was also very subtly decreasing the space between them. I think Delilah was feeling the closing proximity and would make her own adjustments of position. The problem with this game was that Delilah was tethered and was moving further into the paddock to the end of the reach of her leash. Legacy, whether intentional, or not, was closing in on her escape route. To her credit, Delilah didn’t give in and erupt on her own. It took me becoming alarmed and hustling over to set her off to barking at him. I was continuing to rake while keeping and eye on them, until Legacy got close enough to reach her leash and got it in his mouth. I figured nothing good could come of this and dropped the rake to hustle over there and intervene. Delilah barked, Legacy startled, and the game was over. 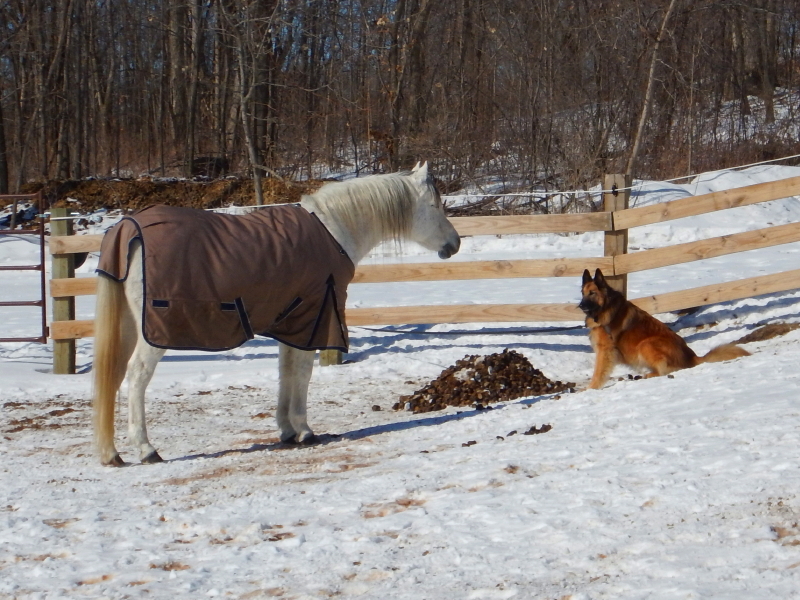 Hopefully, prior to all the excitement, Delilah absorbed enough of Legacy’s zen-like message to practice staying calm when the horses wander over to say hello.